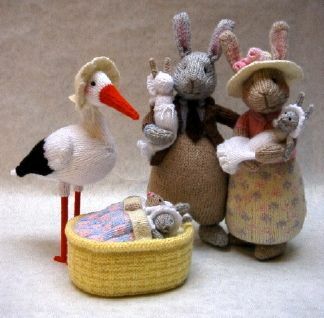 Measurements Mother Bunny is 29cm/11½in tall, Father Bunny is 30cm/12in tall, Nanny Stork is 26cm/10in tall, babies are 13cm/5in tall and cradle is 14cm/5½in long, 10cm/4in high. You will need Of Hayfield Bonus D.K. 100g balls: 40g in White 961, 30g in Oatmeal 964, and Aran 993, 20g each in Silver Cloud 968, Walnut 927, and Primrose 957, 10g each in Pink 992, Powder Blue 960, and Black 965, and 5g each in Lilac 959, Iced Pink 958, Chocolate 947, and Signal Red 977; 150g of washable toy stuffing; pair of 3mm (no.11) knitting needles; stitch holder; long tweezers; pair of compasses; pink pencil; stiff white card; tracing paper and pencil; two plastic drinking straws; clear adhesive; double-sided sticky tape (optional).